Firstly I should really start with an apology, it has been nearly two months since my last blog post, and I hate myself a little for that, but I have my reasons. I started blogging to get into the habit of writing, in preparation for my thesis, and now I am in full swing of writing up. So after a full day of writing I have been finding it hard to motivate myself to blog. I have, on the other hand, been baking lots of bread and cakes. Some of these I have really enjoyed, and plan on writing up at some point such as the tortillas, the pitas or the blueberry cinnamon swirls. Most of these bakes feature as photos on Instagram if anyone is interested @breadandbikes. 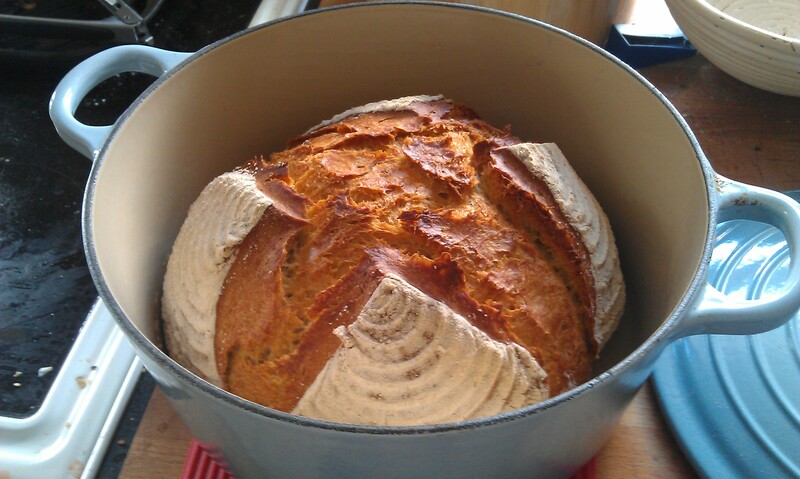 This post is about my Le Creuset, and a recovery of my sourdough starter. Sadly it has been living in my fridge for weeks now, at the point where bringing it back to life was always too much preparation for a bake. So this time I did what I often do, just used it anyway. My plan was to use the starter to give an extra boost to the bread, supplemented by the yeast for the actual rise. I did break from my normal tradition by using three proving phases, to really develop the loaf. To bake I preheated the Le Creuset in the oven for an hour, then turned the loaf out of the banneton straight into the dish. I had dusted the base of the loaf with brown rice flour, to try and avoid burning the loaf to the dish. Slash, then put the lid back on and return to the oven. The actual bake took much longer than I had anticipated, the temperature of my oven usually results in loaves cooking in about 30 mins, but this took much closer to 50. The wait was well worth it. Someone may have to correct me on the science here, but I assume because it is covered you do not get the trying effect of the fan oven, coupled with the moisture being trapped in, meaning the crust takes longer to form. This allowed the bread to open up more and resulted in a fantastic texture on top, with a really soft crumb. I’m not sure it is an effort I want to go through every time I bake, but I will certainly be trying it again. That looks fantastic Olly. Hope the thesis is doing as well.